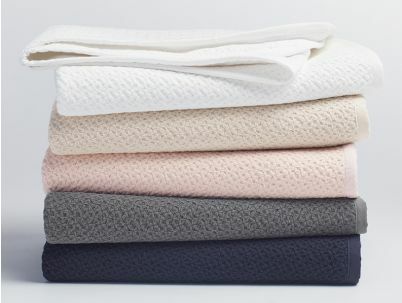 Inspired by Coyuchi's popular adult blanket, our Fair Trade Certified™ Factory baby blanket features the same chunky weave for soothing texture against baby’s skin. Made of pure organic cotton, it’s pre-shrunk to retain its shape, year after year and wash after wash. Piece dyeing creates variations in color that make each piece unique. Finished with color-matched percale trim. Our cotton is 100% organic, and sourced and woven in India. 29" x 34"